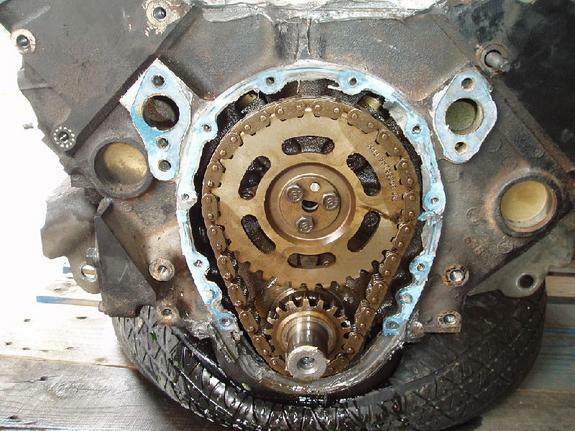 The timing chain on a Chevrolet 350 engine (also known as the 350 SBC, for small block Chevy) rotates the camshaft in synchronization to the crankshaft rotation. After years of service (or tens of thousands of miles of use) timing chains can stretch. This can affect the performance of the engine. Additionally, the camshaft gear can wear. 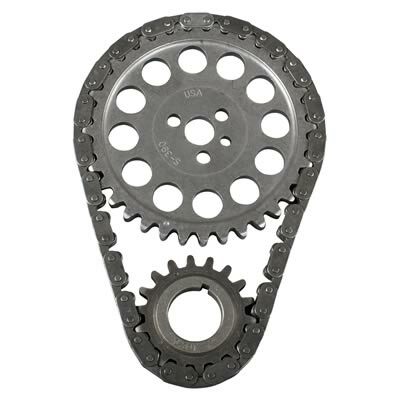 (Older cam sprockets were made with nylon teeth for quieter operation and would fail, rendering the engine inoperable.) As a do-it-yourself project, the replacement of these parts can take the better part of a single day, so plan accordingly and organize the required tools and parts beforehand. 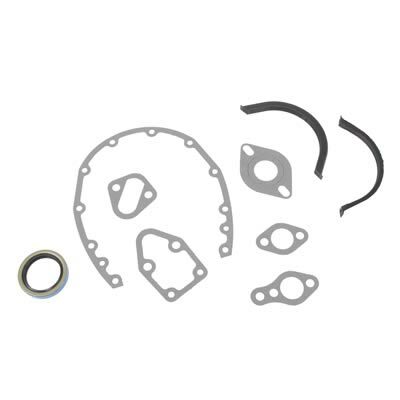 Order or purchase the correct timing set (chain and two sprockets) and gasket set for the engine model being repaired. Be certain to specify the model year and application of the engine. Also include a small tube of gasket sealer in the purchase. Local parts stores typically have these items in stock and may have balancer puller and installation tools available for rent. You can also order the parts online from parts vendors. Remove the fan from the water pump. Next, identify and remove all drive belts and accessory fasteners/bolts so you can remove the water pump. These will vary from vehicle to vehicle, but examples might be steering pump, alternator or A/C brackets. Loosen and remove the water pump (four bolts attach the water pump to the front of the engine block). Scrape and clean the gasket surfaces of each. Remove any pulleys attached to the harmonic balancer. Remove the balancer bolt and attach the harmonic balancer puller to the front of the balancer and tighten the center bolt to pull the balancer off the crankshaft. Remove several of the front oil pan bolts and loosen the remainder so that the oil pan can be partially lowered away from the timing cover. Remove all timing cover bolts and gently pry the cover away from the engine block. Scrape and clean all gasket surfaces. Remove and replace the front crankshaft seal in the timing cover. Rotate the engine by hand so that the two timing marks on both sprockets are aligned. Remove the three cam sprocket bolts and slide the cam sprocket off the camshaft. Slip the chain under/off the crank sprocket. Install the new chain and camshaft sprocket, making certain both timing marks are aligned at their closest point. (Tip: Crank sprockets rarely fail or wear. If no damage is visible, you can save time by not replacing it.) Tighten the cam sprocket bolts to 20 pound-feet of torque. Apply a modest amount of gasket sealer/adhesive to the mating surfaces of the timing cover and engine block. Reinstall the timing cover with 6 pound-feet of torque to each bolt. Apply a small "dab" of silicon sealant at each end of the oil pan seal. Replace/tighten all the oil pan bolts. Apply a small amount of oil or assembly lube to the surface of the front seal and balancer hub, then reinstall the harmonic balancer with the replacement installer/press. (Do not reinstall the balancer with the bolt or a hammer.) Replace the balancer center bolt using 60 pound-feet of torque. Continue to reinstall all of the components that were previously removed in reverse order. Finally, refill the radiator coolant, start the engine and check for any coolant leaks and repair, if needed.